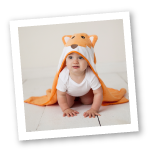 Luvable Friends offers baby soft goods at an incredible value to parents. Our mission is simply to make baby apparel and products fun and affordable without compromising on quality. We believe cute designs and bright colors make everyone appreciate the beauty life has to offer. Enjoy the love your baby brings to your life with Luvable Friends! Hudson Baby features premium baby basics with modern designs and more durable, softer fabrics. We strive to enhance comfort, quality and cuteness of baby essentials with gentle fabrics and detailed designs for your little one. Our line includes apparel, bibs, blankets, gift sets, hooded towels, socks, washcloths and more. Give your baby the best life has to offer with Hudson Baby! Yoga Sprout features fun, comfortable athletic wear with vibrant colors and playful patterns. Our stretchable, Yoga-inspired fabric is sure to keep up with your active little sprout. Features adorable fold-over Yoga pants paired with coordinating hoodie, bodysuits, caps, bibs & blankets. From happy baby pose to every day adventures, grow, relax & be happy, with Yoga Sprout. Touched by Nature offers 100% luxuriously soft, organic cotton baby clothing and bedding essentials. Our 100% organic cotton line is incredibly gentle and comfy on baby’s sensitive skin and more sustainable for our planet. Touched by Nature offers coordinating designs across accessories, bedding, clothing, feeding, footwear and more to make for an adorably stylish, cozy nursery and wardrobe for your precious baby! Little Treasure presents high-end designs in baby apparel and accessories without the designer price. Our line includes apparel, bibs, hooded towels and washcloths with more to come. We make baby essentials that maximize your little one’s comfort and cuteness. Comfortable, cozy babies mean happy babies, and happy babies mean relaxed parents! 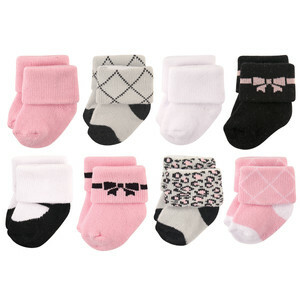 Hudson Baby 8 Pack Terry Socks keep baby's feet warm and cozy! This cuff style helps the socks to stay on! Super soft cotton blend is gentle on baby's foot and stretches to fit a wide range of age. Inside of sock has loop cotton terry for comfort and warmth. These fashionable and affordable socks are designed to mix and match with most outfits. These socks are thick and are cushiony for keeping baby warm and snug! BabyVision, Inc. is fully compliant with all Consumer Product Safety Comission (CPSC) guidlines.